Greeting your students at the door is so important to setting a classroom and school culture. 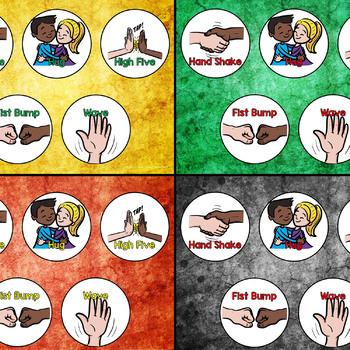 Meeting your students with a hearty handshake, a fist bump, or a comforting hug can set the tone for the day and get your kids off on the right start. It also builds self-respect, confidence, and positive thinking. 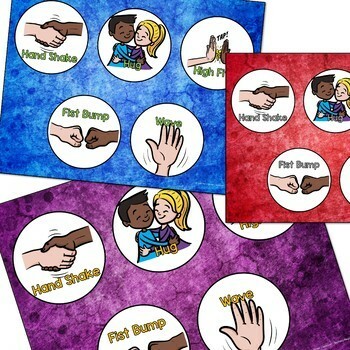 This printable resource allows your students to pick the greeting that they feel most comfortable with for that day. Just hang it outside your classroom and allow students to pick their daily greeting. It comes in a multitude of colors to match your décor and is great for any age.